When we listed our favorite icon themes for Ubuntu, Faenza Variants were among the ones that stole the limelight. 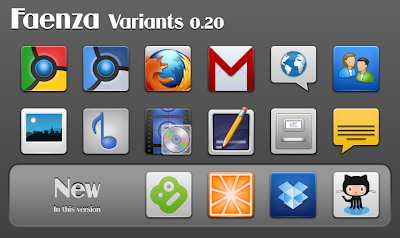 Faenza Variants version 0.20 is a more complete package with a number of new icons and more polish. Latest Faenza Variants version 0.20 comes with new icons for a number of popular applications like Clementine, Boxee, Dropbox and Github Octocat. Small sizes for all icons are available as well. There is even a panel icon replacement while moving or copying files. I am a big fan of Faenza Icon Theme and various other derivative works of Faenza icon theme like Faenza Variants. In my opinion, two GTK themes that blends perfectly with Faenza theme are Equinox and Orta. Check them out and let us know your reviews.